We have this crazy tradition in our family, grab yourself an unique party theme and slap it onto your relatives. You? You are bringing a Moroccan salad! So yeah, sure. I got one. So, you Google it. 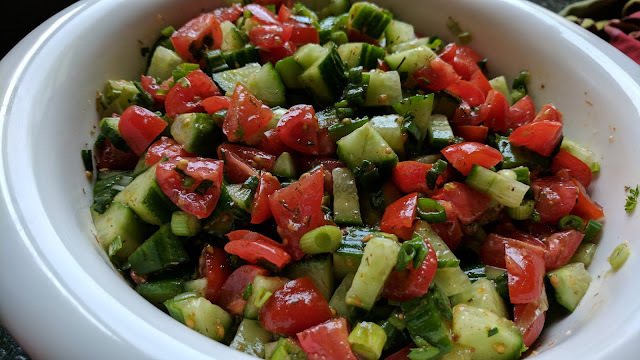 Hmmmm, this seems like every other Mediterranean salad I ever made. What exactly makes this different? Frankly, I am not sure, but it IS different. It may be the size that you cut them into, it may be the combination, the olive oil, the parsley, or the seasoning. It is incredibly delicious and easy to make. Don't believe me, just try it. I think you will like it. Waiting for the next theme, or dreaming up some challenge for my sisters soon. What do YOU think? Czech Republic? Poland? Ghana? Uruguay? Chop everything, add the olive oil and lemon zest and juice. Season well with salt and pepper. Chill until ready to serve. Best made 1-2 hours before serving. Golden and fragrant, we loved the beautiful color and flavors of this dish. This one is somewhat healthy too. This one is a quick dinner to pull together, and reheats nicely too. Inspired by this recipe, but simplified by me (because I am like that). 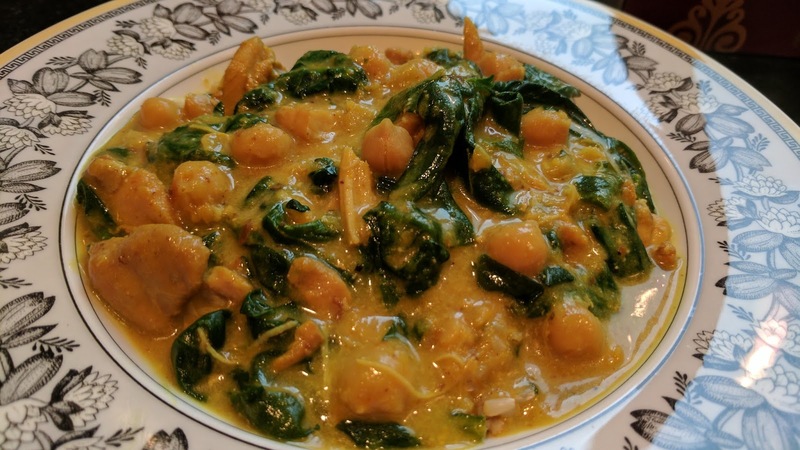 I usually have boneless, skinless chicken thighs in the freezer, canned chickpeas (garbanzo beans) on the pantry shelf and fresh spinach hanging around. We have made this with the yogurt addition at the end, and without, and frankly, both are delicious. If you don't have the yogurt, skip it, but don't skip this recipe it's so tasty. If you don't like spicy hot, omit the cayenne pepper, otherwise, curry powder and turmeric are not that spicy, just golden and fragrant. Heat oil in a large heavy pot over medium-high heat. Season chicken with salt. Working in batches, cook chicken, reducing heat as needed to prevent over-browning, until golden brown on all sides, 8-10 minutes per batch. Transfer to a plate. Add butter and onions to drippings in pot; season with salt. Cook, stirring often, until onions are soft and golden brown, 10-15 minutes. 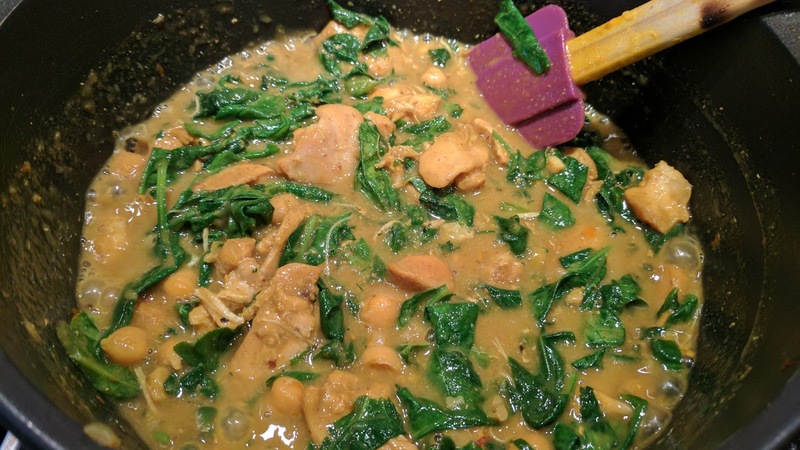 Stir in garlic, ginger, curry powder, cumin, turmeric, and cayenne. Cook, stirring constantly, until spices are fragrant, about 1 minute. Stir in chickpeas and 1 cup broth. Return chicken and any accumulated juices to pot. Add more broth if needed to cover chicken about three-fourths of the way up. Bring to a simmer. Cover pot and turn the heat to low, braise chicken until fork-tender, 45-55 minutes. Add spinach to pot, cook until spinach is wilted, 3-4 minutes. Turn off heat, stir yogurt into cooking liquid. Season with salt and sprinkle with cilantro. Spoon chicken mixture over white, or basmati, rice.